Earth, equatorial diameter: 12,756 km (7926 mi). Venus, diameter: 12,103.6 km (7,520.8 mi). Mars, equatorial diameter: 6,794 km (4,222 mi). Ganymede (Jupiter III, diameter: 5,268 km / 3,273 mi) is the largest moon of Jupiter and in the Solar System, and the only moon known to have a magnetic field. It also probably has an internal ocean under its surface that may contain more water than all of Earth’s oceans combined. Titan (diameter: 5,151 km / 3,200 mi) is the largest moon of Saturn. It is the only moon in the solar system known to have a dense atmosphere, and so far, the only object in space, other than Earth, where clear evidence of stable bodies of surface liquid has been found. These conditions may make Titan the most hospitable extraterrestrial world within our solar system for human colonization. It also may have extraterrestrial life. On January 14, 2005, ESA’s Huygens probe made its descent to the surface Titan (see the video below). Mercury, diameter: 4,879 km (3,032 mi). Callisto (Jupiter IV, diameter: 4,821 km / 2,996 mi) is the second-largest moon of Jupiter, after Ganymede. It is the third-largest moon in the Solar System after Ganymede and Saturn’s largest moon Titan. Galileo spacecraftNotes 1 revealed that Callisto may have a small silicate core and possibly a subsurface ocean of liquid water at depths greater than 100 km. Io (Jupiter I, diameter: 3,643 km / 2,264 mi) is the innermost of the four Galilean moonsNotes 2 of Jupiter. It is the fourth-largest moon, has the highest density of all the moons, and has the least amount of water of any known astronomical object in the Solar System. Moon, diameter: 3,474 km (2,159 mi). Europa (Jupiter II, diameter: 3,122 km / 1,940 mi) is the smallest of the four Galilean moons orbiting Jupiter and the sixth-closest to the planet. It has a smooth and bright surface, with a layer of water surrounding the mantle of the planet, thought to be 100 kilometers thick. The smooth surface includes a layer of ice, while the bottom of the ice is theorized to be liquid water. The apparent youth and smoothness of the surface have led to the hypothesis that a water ocean exists beneath it, which could conceivably serve as an abode for extraterrestrial life. Heat energy from tidal flexing ensures that the ocean remains liquid and drives geological activity. Life may exist in Europa’s under-ice ocean, perhaps subsisting in an environment similar to Earth’s deep-ocean hydrothermal vents or Antarctica’s Lake Vostok. Life in such an ocean could possibly be similar to microbial life on Earth in the deep ocean. All of the water on Jupiter’s moon Europa compared to all of the water on Earth. Scientists’ consensus is that a layer of liquid water exists beneath Europa’s surface. It is estimated that the outer crust of solid ice is approximately 10–30 kilometers (6–19 mi) thick, including a ductile “warm ice” layer, which could mean that the liquid ocean underneath may be about 100 kilometers (60 mi) deep. This leads to a volume of Europa’s oceans of 3 × 1018 m3, between two or three times the volume of Earth’s oceans. Triton (diameter: 2,707 km / 1,682 km) is the largest natural satellite of the planet Neptune, and the first Neptunian moon to be discovered. It was discovered on October 10, 1846, by English astronomer William Lassell. It is the only large moon in the Solar System with a retrograde orbit, an orbit in the opposite direction to its planet’s rotation. It is the seventh-largest moon in the Solar System. Because of its retrograde orbit and composition similar to Pluto’s, Triton is thought to have been a dwarf planet captured from the Kuiper belt. Triton is one of the few moons in the Solar System known to be geologically active (the others being Jupiter’s Io and Europa, and Saturn’s Enceladus and Titan). As a consequence, its surface is relatively young with few obvious impact craters, and a complex geological history revealed in intricate cryovolcanic and tectonic terrains. Part of its surface has geysers erupting sublimated nitrogen gas, contributing to a tenuous nitrogen atmosphere less than 1/70,000 the pressure of Earth’s atmosphere at sea level. It is the second largest planetary moon in relation to its primary (Earth’s moon is the largest). Pluto, diameter: 2,377 km / 1,477 mi. 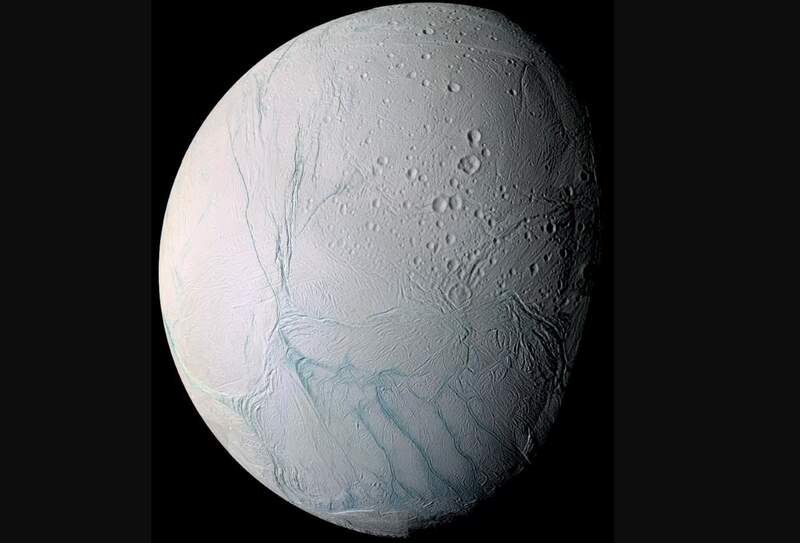 Enceladus (diameter: 504 km / 313 mi) is the sixth-largest moon of Saturn. It is mostly covered by fresh, clean ice, making it one of the most reflective bodies of the Solar System. Enceladus ejects plumes of salt water that are laced with grains of silica-rich sand, nitrogen (in ammonia), and organic molecules, including trace amounts of simple hydrocarbons. This indicates that hydrothermal activity may be at work in Enceladus’s subsurface ocean. The presence of an internal global salty ocean with an aquatic environment supported by global ocean circulation patterns, with an energy source and simple organic compounds in contact with Enceladus’s rocky core, may advance the study of astrobiology and the study of potentially habitable environments for microbial extraterrestrial life. Therefore, several robotic missions have been proposed to further explore Enceladus and assess its habitability; some of the proposed missions are: Journey to Enceladus and Titan (JET), Enceladus Explorer (En-Ex), Enceladus Life Finder (ELF), Life Investigation For Enceladus (LIFE), and Enceladus Life Signatures and Habitability (ELSAH). Launched on October 18, 1989, carried by Space Shuttle Atlantis, on the STS-34 mission, Galileo was an American unmanned spacecraft that studied the planet Jupiter and its moons, as well as several other Solar System bodies.